I can’t remember the first day I heard of GISHWHES – the Greatest International Scavenger Hunt the World Has Ever Seen. I do, however, remember every single scavenger hunt item I’ve taken on, every day of the week-long, yearly, pay-it-forward awesomeness. Like, the Cheeto-encrusted instrument I used to serenade my lover in a rowboat under a weeping willow tree. 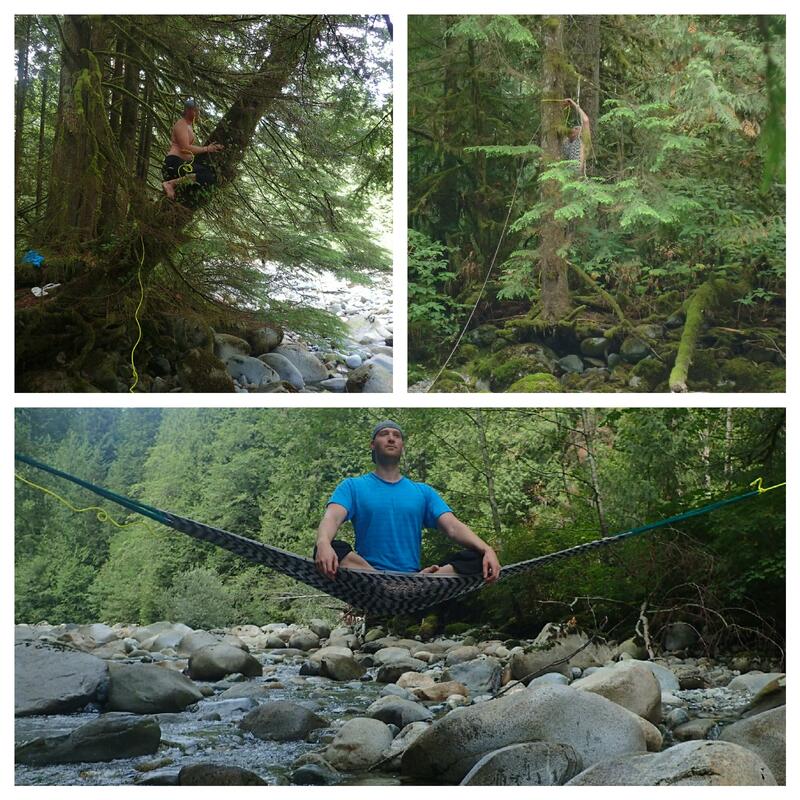 And, the hammock we strung across a river. Or maybe, the hopscotch game I scribbled out with chalk across Stanley Park and then filmed us hopping through while wearing velour track suits in the middle of summer. These are the kinds of crazy amazing things you’ll be asked to do as a GISHWISHER. And, you’ll come to love it. Initially, I had a hard time embracing the playful fun that is GISHWHES. I mean, you want me to ask a nationally elected politician to publicly state the Slangaroo is their top legislative priority? I have to find 26 people to make a human piano? You want me to dress up as WHAT?! Once I started shedding my ego-based concerns, however, I started to really enjoy myself. This was an adventure, a challenge, and it got me WAY out of my comfort zone. I did things I’d never try, think of, or attempt. And in doing so, I started feeling pretty darn amazing. A big part of GISHWHES offers the opportunity to pay-it-forward. Many of the challenges I took on this year involved offering happiness, giving things to those less fortunate, or raising awareness. A few that other teammates grabbed had us living out our dreams, or, “becoming love”. There’s something transformative about GISHWHES, something that honors us all as beautiful, BadassAF beings. That’s what makes this whole experience memorable. It’s helped me evolve into a butterfly – the butterfly I was always meant to become, yet, had no idea how to create the conditions to get there. Phew! Yes, GISHing changed me. It made me a better woman, a better version of myself. I doubt Misha Collins, the man behind GISHWHES, intended this outcome. Or, maybe that was his Supernatural plan all along. The Best Part of GISHWHES? After this year’s event, I found myself trying to decide what to eat with a handful of folks from other teams. One of our challenges involved finding other GISHWHES teams on a specific day and decorating a bus stop with inspirational post-it notes. Once finished, a few of us realized we had yet to eat that day. It was 13h. So, we ventured into a shop in front of our bus stop, and then stood there, confused as to what to buy. I hope that next year, there’s an item that supports us all in this effort. Or, at the very least, gets us to document our (healthy, loving and taking good care of ourselves) meals. So, ready to hear what a day in the life of GISHWHES? Wondering if it’s something you want to take on? (You do). Questioning your sanity by signing up? (Yep, it’s insane. Insanely FUN). Here’s one of my seven days during the 2016 GISHWHES. [… and… the complete list of items]. Feel free to comment, share your own stories and links to your submissions. My favorite bits of the event aren’t necessarily the “doing” or “creating”, but rather, seeing what others did and created. How they changed the world for the better, right alongside me. Post to private FB, asking if someone can go down to Bellingham for newly announced #36 – wishing Misha’s Mom a surprise Happy Birthday. I tag everyone that FB shows me has been in Bellingham, as well as friends living near the border. Replies filter throughout the day – eight hours behind where I am in London, England. No one can do it last minute, but, I recruit two friends for next year’s GISHWHES. I see that the Holi Festival in London, England, takes place a week after GISHWHES finishes. I make a mental note to share it with the other teams to see if anyone wants to join me. Post to private FB asking for help locally in London, to take pictures of me doing GISHWHES things – again. Throughout the day, friends I’ve tagged reply saying they know no one with time on their hands. I reply to a friend on Facebook who now lives in Australia, originally from just outside London, “Maybe you could place a watermelon for me in Sydney? Surely you know people in London that might want to help me out, and, introduce me to”. I accept a friend request from a gent I met at the Brexit Red Rover challenge item (that’s me talking! The Canadian whistleblower). He said my name the way it should be (Boh-NAY instead of Bawn-NEE), so, he offered to become my cell phone ring tone. Thanks again, Alex! Contact the nine team members that haven’t checked in, or, assigned themselves a task. [Note – I did have access to both of these nationally elected politicians (a requirement of the item). As the days wore on, however, I was so demoralized by my teammates non-participation that I didn’t follow through]. The idea was that maybe GISH hasn’t been in the delivery room, yet, and that I could get a onesie on a newborn with words, “GISHWHES WINNER 2030” on it – 14 years in the future, when they can participate. I also asked for maternity ward workers, and jail staff to cover my bases. A new Facebook friend from the Brexit Red Rover item posts, “Another weird request – I need the reflective dots that go on the road (Botts dots or cats eyes or whatever you call them) … I would like to borrow 47 :) Also unrelatedly a goat. 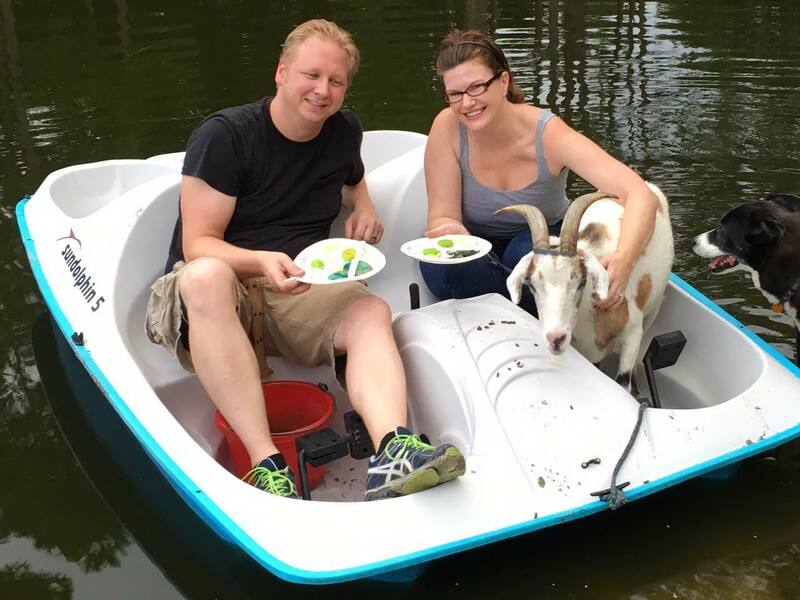 Because who doesn’t need a goat, a boat and some green eggs and ham”. Team Orlando United Loves Mishas Monkeys shares green eggs and ham with a goat in a boat. One team member replies to email request, saying they’ll look at the list later today. Decide to take on #100 (Tweet link to a video about saving people’s lives), and post in the private social network I created for my team, to ask for help from teammates. Also post in a private, work-related group, and message a friend to do the same. I log into all my Twitter accounts, post/retweet the link, and take screenshots. Teammate (same one as 17:24) asks if they need to post what they’re taking in the social network I created. I reply no, that they need to assign it to themselves on the GISHWHES site. I let them know I assigned it to them and explained how to do it themselves. Reply again to the teammate above with more clarity (on my part). This is the last time I hear from this person; they never submitted their one item. Post to local CouchSurfing group to see if I can get group help with piano and red wine challenges. One FB friend suggests I contact local university student unions, Freecycle and use Craigslist for photography help. Talk to a local on Couchsurfing about some options, such as where to get William Shatner sightings, where to go where no one else can, and if I could find somewhere to herd sheep in town. [Sheep herding was for one item needing a stormtrooper to do something pre-industrial… I thought of sheep herding with one of the sheep called Nerf]. Review for what seems like the 100th time to see if other team members have taken on anything new. Nope. I beg for more smelly penguin retweets. Friends who want to participate in GISHWHES (international scavenger hunt) but can’t for whatever reason… I need your help! Or, anyone that wants to support these penguins… If you have Twitter, here is your assignment (takes 30 seconds, please email me a screenshot of your Tweet). Feel free to tag anyone that might want to assist. Let’s save ’em! http://www.telegraph.co.uk/…/penguins-on-worlds-smelliest-…/ Tweet your support to https://twitter.com/BAS_News and hashtag‪#‎gishwhesLovesSmellyPenguins‬ and ‪#‎MissB‬. Get at least 20 people to post their support. Submit a grid image of screenshots of the posts. A gerbil-owning colleague offers to help me with the video of a rodent spa. While the item says, “hedgehog, mouse or hamster,” I interpret a gerbil as being perfectly awesome. I also ask folks if they can follow up with me to connect with a professional bodybuilder or MMA fighter to create an infomercial about the fat-burning benefits of spray cheese. Today I hear from other teams that Monsieur Bill has posted Misha’s mailing address on his Twitter profile as payback. I find Shatner’s address through his PR folks, and get my postcards ready. [A few days later, he’s on a British TV show I’ve never heard of, and I manage to get a picture of us together to submit]. A friend on Facebook sends me this message, publicly. My first reaction was to go re-read the instructions. Yet, I’d just had this conversation with several teams a day or two prior at Brexit Red Rover in London. I knew I was okay; the instructions clearly said you can’t outsource everything, but you can the location-based ones, and you can as long as they aren’t every single item. As well, I wasn’t asking people to do the items FOR me. I was asking for connections, introductions, information so I could go do it myself. Uh, Perhaps I Need a Break? After sharing these thoughts with my friend, she then asked me if I was getting results. I said yes, with the Twitter items, not so much with the bigger ones. Admittedly, this message popped my bubble. I’m not blaming or shaming my friend at all – she was just doing what she thought was best. Thinking about this message, I took it to heart. I was going all-out to get help and support to “win” GISHWHES. When I saw the list the first day, I realized I could do most of it by myself, and quite easily (if lacking in sleep). I should be asking my team — but they were AWOL. Non-existent. Refusing to communicate or follow through. I later found out one had been in a car accident (he did send us a message to let us know). The rest, I’ll never know what happened, or why they paid money to participate and then… didn’t. Regardless, this was where I lost all steam and stopped putting my all into the process. I also started brainstorming as to how I could avoid feeling so deflated and alone in the future. A few hours later, after some chats with other, repeated runner-up teams… I discovered many of them took applications. They started right as GISH ended one year, up until a month prior to the next. They then reviewed and decided who fit the group’s needs well, who communicated openly, who offered experience and insanity. An amateur wrestler friend (think WWE, but at a local-level) posted on his Facebook for me. A very nice young lady I know is looking for some help in a video scavenger hunt. Figured it couldn’t hurt to put this out there since half of my friends list fits the description of what she’s looking for. If you are able to give her a hand shoot me a message please. A friend from Vancouver calls me, and we end up chatting the rest of the night and into the wee hours. Someone in the GISHWHES UK Meetup group (created to connect for the bus stop challenge on August 6th), suggested I change the event to “Central London” instead of “North London” to get more participants. I did, and, had about a dozen different representatives from various teams show up. Hands up, that’s me! Did I Sleep During GISHWHES? Well, no. Not this day, anyway. I ended up talking to my travel partner half the night about things to pack for a big trip and completely lost track of time. I got little sleep the first few days, in part because I wanted to document my journey for those wondering about GISHWHES and whether to participate or not. As well, I really had it in my head that I wanted to try and “win” even though I had so many absent teammates. I gave that up once the exhaustion hit, and, I’m glad I did. Biggest lesson learned? Choose your teammates wisely, especially if you love working in a team as I do. Want to join me next year, perhaps on a team together? Feel free to comment and I’ll be in touch.